As ecommerce stores try to compete with Amazon and Walmart, they continue to seek ways to not only speed up the process from the time the customer places an order to actually receiving the product at their door, but also try to cut their own costs and become more efficient. These two scenarios present a challenge because at first glance it appears that it is difficult to present the customer with a more efficient process from purchase right through to delivery, and lower administrative costs at the same time. Yet xocbox has helped Yahoo Store Merchants do this by offering an EDI solution which enables them to eliminate some manual tasks, and frees up employees’ time so they can work on higher value projects. Unlike some of the web-EDI solutions offered to online stores, the EDI solution that xocbox offers Yahoo stores is a fully integrated product which means that you do not have to re-key data into a third party product in order to pass the data on to the EDI trading partner. A great benefit to Yahoo merchants is that this has allowed them to trade with suppliers who will only sell to them if they use EDI, enabling them to offer a much greater selection of products, and increase their sales revenue. xocbox provided the back-end system required to achieve this, and worked with their suppliers to ensure that transactions were processed correctly. Once all testing was complete, they were up and running with a new supplier. No additional staff or training was required by the store to do this, and they were able to introduce a new line of products to their store. With xocbox EDI Yahoo stores are able to manage their orders, and also product onboarding and inventory. By transacting with your partners electronically you can save time, offer a greater range of products, and free up time to do other valuable tasks within your business. 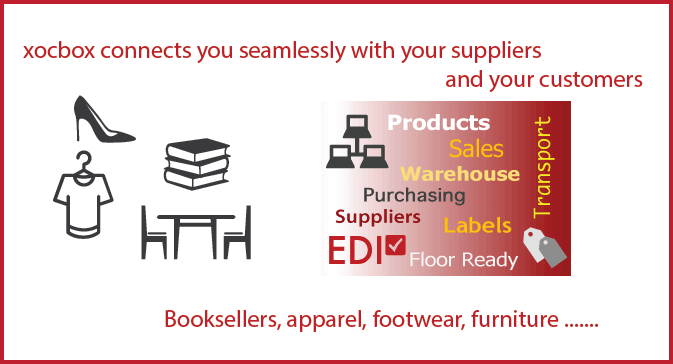 If this sounds like something that would work for your store, learn more about the Benefits of xocbox EDI products here, or call xocbox at 858-752-3803. For those looking to automate just about everything – from product onboarding, taking orders, and shipping products – read about the xocbox No Touch Store, where you literally don’t have to touch a thing.